“Exhibition” a public display of works of art or items of interest, held in an art gallery or museum or at a trade. “Expedition” a journey undertaken by a group of people with a particular purpose, especially that of exploration and research. These definitions are in my view an excellent summary of The Image Circle Exhibition which took place at The Oxmarket in Chichester last month. A number of weeks have now passed and I have had time to look back on what was a very successful, albeit quite an exhausting experience. Let me start at the beginning. 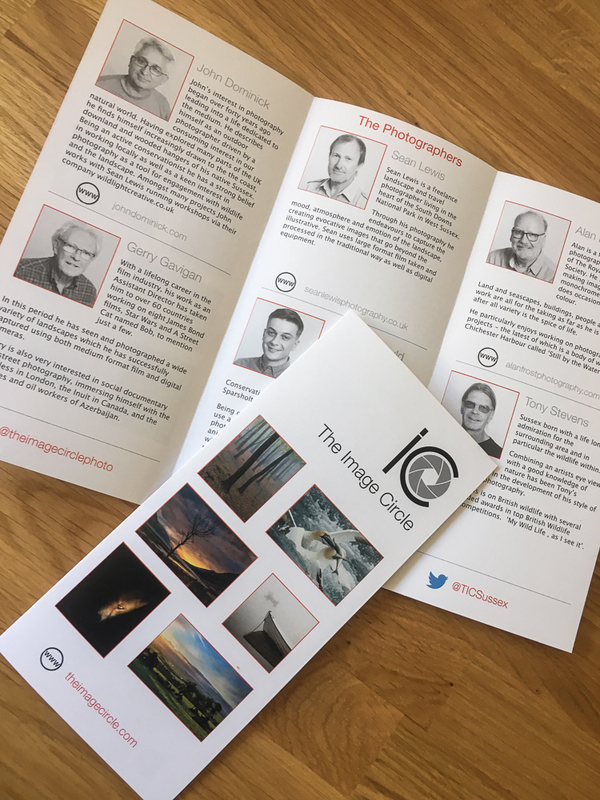 The Image Circle is a group of six like minded photographers all with an interest in outdoor photography, whether that be landscapes or nature. 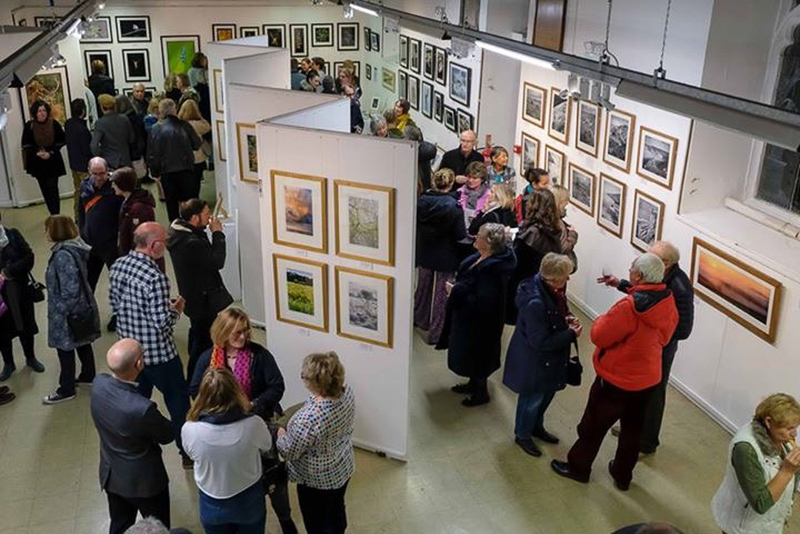 None of us had exhibited before, so 15 months ago we booked our slot at The Oxmarket Centre of Arts and began our preparation. A logo for the group was devised, a website set up and then individually we went about deciding what to exhibit, and how the pictures should be presented and framed. We also had to divide the gallery space so that we were all happy with our allocated hanging area. Marketing the event was also a major consideration but I’ll come back to that later. The six of us met regularly during the year and in the week before the exhibition final details were discussed and agreed. We arrived early on the first day to set everything up, hang and label our pictures. We had also arranged a private view for that evening having invited family, friends, other acquaintances and contacts. 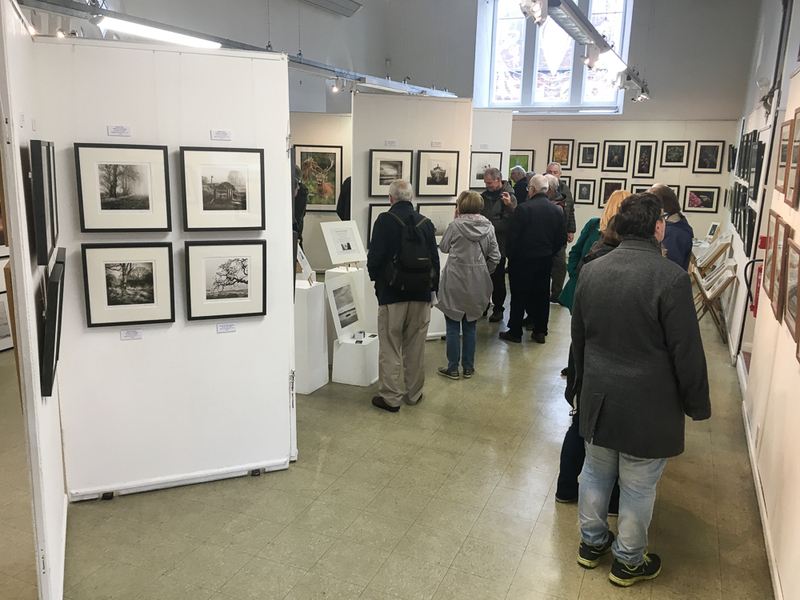 The exhibition was open for one week and whilst it was difficult to count everyone who came through the doors we together with the gallery estimated that between 800 and 1,000 people came to see our work. These numbers exceeded our expectations and apparently was higher than the average attendance for The Oxmarket. One of the great benefits was the opportunity to meet and talk to so many people who showed an interest in our photography. Another aim of the exhibition was to raise awareness about The Image Circle and judging by the feedback this objective was definitely achieved. Several pages in the visitors book were completed. Here is just one of them. 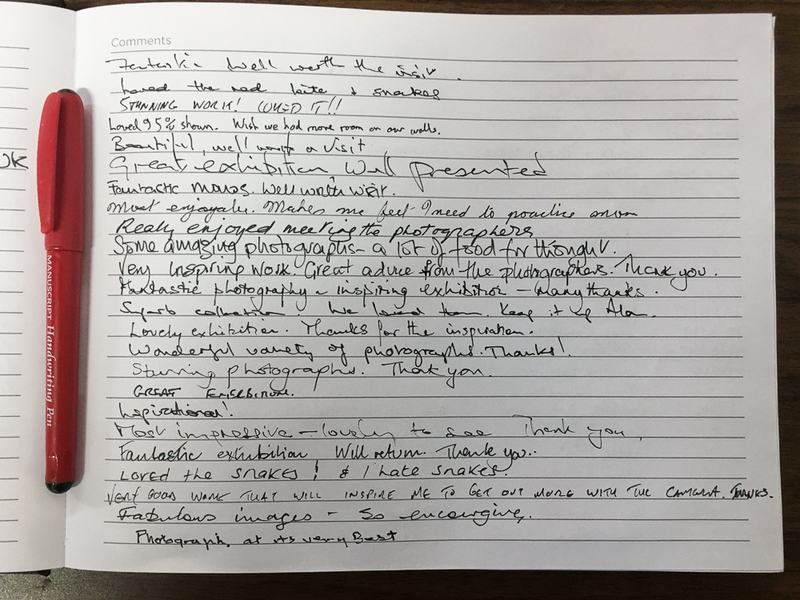 A page from the visitors book – it makes good reading! Staging a successful exhibition relies on people coming to see it; as I mentioned earlier marketing prior to the event was key. Flyers were prepared and distributed to various contacts including other camera clubs. As well as The Image Circle website we set up Twitter and Facebook accounts and these were also used to promote the event. With the benefit of hindsight we could probably have used social media more effectively – a lesson learned for the future. 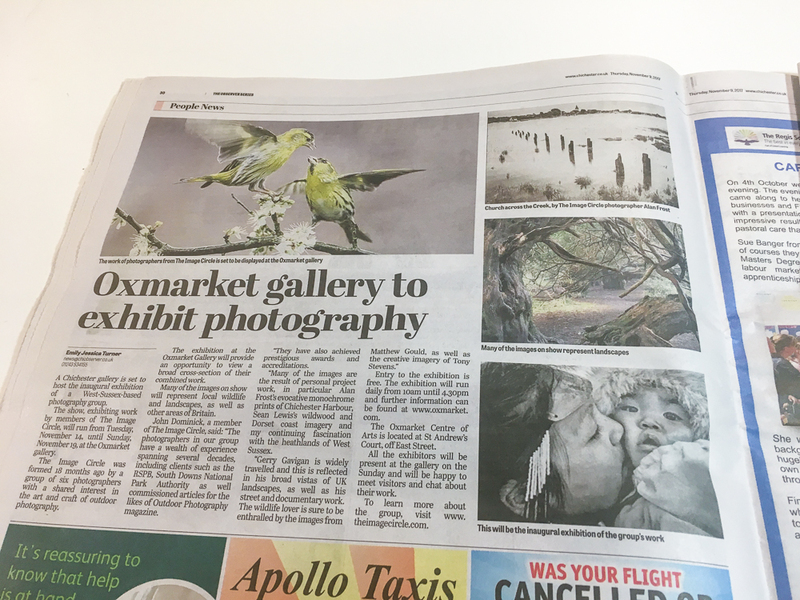 We were fortunate to get not just one, but two pages in the Chichester Observer; our local newspaper. We are sure the combined effect of these various initiatives all helped get people through the door. Those that did come were each given a leaflet about the group. We had more than enough printed so they can be used at other events. We also felt that having a leaflet reinforced the credibility of The Image Circle. From a purely commercial point of view all six photographers achieved sales of their work. In fact there was £5,000 worth of sales between us, which was well above expectations and will certainly have helped towards recovering our costs. One or two of us might even have made a modest profit! It has to be said that the intention of the exhibition was to launch the group. It was not about sales per se; so the fact we did well from this point of view was a bonus. Exhibition over and I for one can reflect on the week and the months leading up to the exhibition itself. There is no question that there was a lot of planning and work involved over quite a long period of time to make the event a success. Staging an exhibition is not an easy or a cheap exercise and although we sold some of our work there was always the possibility that we might not sell anything at all. Was all the effort and expense worth it? From my point of view, absolutely. The whole experience, or should I call it expedition, was a most enjoyable one. Full of hurdles to jump, decisions to be made and deadlines to be met. Exhausting yes, as the effort involved should not be underestimated both before and during the exhibition itself. The interaction with the public and their feedback was of great value to all of us and I am sure will lead to other opportunities. 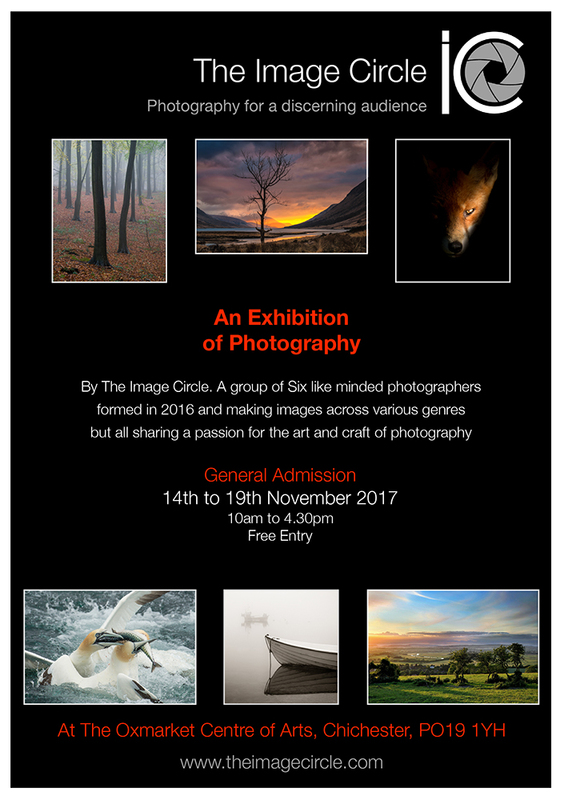 I have already been asked to give a talk at a local camera club and on the back of this exhibition I will be displaying my work at another venue in 2018. Others have had requests for possible future workshops and traffic to my website rose significantly during the week. As a group we never thought we would want to exhibit on annual basis, there is simply too much work involved, not to mention the costs associated with an event of this nature. However plans are already being considered for another Image Circle exhibition in 2019. 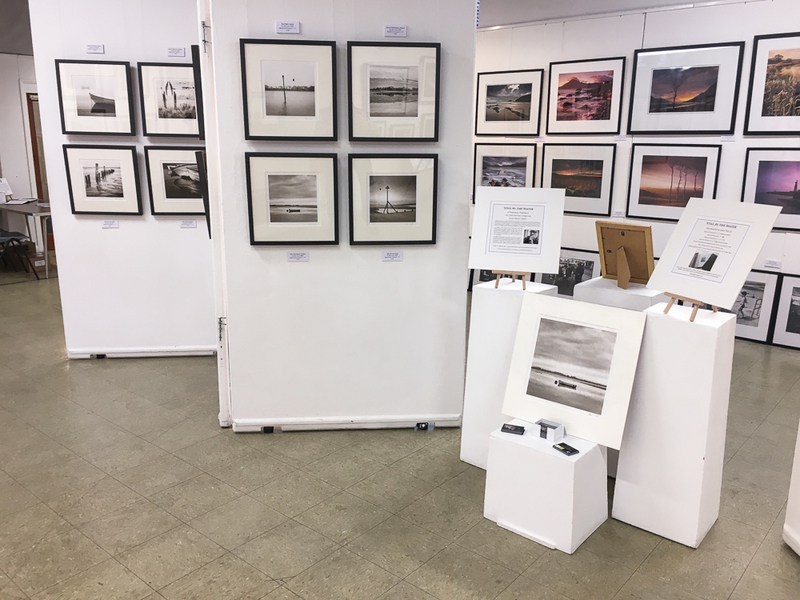 Regular readers will already know that I chose to display 24 photographs from my ‘Still by the Water’ Collection of Chichester Harbour. All of which can be seen here. I also created a flyer for my own work and in addition I also prepared a bespoke portfolio of 44 photographs to accompany the framed images. This added greatly to the time taken to get ready for the exhibition but it was definitely worthwhile. From a purely personal point of view I now wish to take a little time to consider my plans, new projects and objectives for 2018. Some of the ideas are already beginning to take shape and doubtless I will be writing about them on this blog in the weeks and months ahead. Although the group believe we got a lot right, we also know there are things we could improve upon next time round. All in all it was a most valuable and gratifying experience. More importantly we hope that the people that came to see us, enjoyed looking at our images and talking to us individually about our work. Hopefully these people will return the next time we display our photographs. Thank you so much for describing the exhibition process – so many non-creatives have little idea of the enormous amount of work that goes into an exhibition. Just the publicity alone is an major undertaking. Get is wrong and regardless of the skill and beauty of the works, you can end up with an empty room on opening night. I wish I had been there to see it all in person, as I’m not as familiar with the other 5 photographer’s subject matter very much at all. I’m such a fan of Black & White photography and the little I’ve done myself means I know how difficult it is photograph nature effectively in B & W.
Well done and congratulations, Alan. I look forward to hearing about more successful exhibitions in the future. Thanks so much Vicki. Fortunately my working background (before taking early retirement) was related to marketing and design, so producing flyers, leaflets etc, coupled with their importance was second nature to me. As I wrote in the entry I enjoyed the whole process but I wouldn’t want to repeat it too often. I think a biannual exhibition on this scale would be quite enough although I do plan a couple of smaller events next year. I hope your photography is going well. Thanks for all your comments this past year and my best wishes to you for a very happy Christmas and peaceful New Year. Best Wishes for your own Christmas in the U.K. Alan. I guess its a white one for you. Thank you Vicki. Mild and wet is the forecast. White and cold would be much better! Congratulations on what was evidently a successful show. What a lot of work they can be! It is certainly nice when it can be shared with some like-minded friends. I hope you have a very merry Christmas.